Even among historical masterpieces such as the Nikon F, and high-class models like the Nikon F4 and F5, it is apparent that the camera most worthy of recognition as the "Best of Nikon" is the Nikon SP. Perhaps it is because the Nikon SP's level of "precision" — a result of its elaborate construction — surpasses that of any other Nikon camera. There's also a feeling of "tension" that surrounds the SP. Is this feeling of tension caused by the camera's high concentration of advanced technology and richness in quality and functionality ? In this issue, we'll focus on the jam-packed Nikon SP, as well as the S3, the S4 and other cameras that formed the group known as the "SP sisters". Like sisters, these cameras share a number of characteristics. Preceding the SP was the Nikon S2, released in December of 1954. As the Nikon M and S before it, the S2 earned high praise for its lens performance and overall superior quality. But the S2 also featured an operational ease that surpassed its predecessors. In fact, over 60,000 S2s were sold, making it the best-selling camera in the S series. As I've noted in previous articles, the use of interchangeable lenses — particularly among Nikon / Nikkor users — has become more prevalent. Among such users, the S2 was regarded as inconvenient because its viewfinder was only compatible with a 5cm normal lens. The necessity for a built-in universal viewfinder which supported a variety of lenses was something that Nippon Kogaku's development team was already aware of. It's evident that they were also very aware of the "Leica M3", which at the time was considered the world's top 35mm-format  camera. In 1955, the year following the release of the S2, Nippon Kogaku began developing its successor. Their goal of producing a camera that would dethrone the Leica M3 was no longer merely a pipe dream — their technology had come so far as to make this a very real possibility. Their attitude had changed from "catch up" to a more confident, aggressive "overtake" way of thinking. The selector on the right side of the eyepiece on the full-size viewfinder, on the same pivot as the winding knob (crank-type), enables the lighting bright frame (5cm, 8.5cm, 10.5cm and 13.5cm) to be indicated manually. The wideangle viewfinder on the left side of the eyepiece is a real-image viewfinder, and the 3.5cm Albada frame. Focus during the development of the follow-up to the S2 was on the viewfinder. Nippon Kogaku's objective was to achieve "a field of vision that was compatible with interchangeable lenses with different focal lengths", and as they saw it, there were several ways to go about this. One of the ways was to employ a mask-switching real-image viewfinder, which enabled the user to see the view area clearly. This style was used for an external universal viewfinder attached to an accessory shoe. However, the developers determined that the device was simply too big to be incorporated in the planned camera, and the idea was scrapped. They then produced two samples, one of which was a virtual image zoom-type finder. The other finder was a bright frame switchable type. Since the zoom-type finder was too large in those days, the developers opted for the bright type. The operational ease of the Nikon S2's life-size (1x) viewfinder was reconfirmed. This full-size finder was also employed with the SP, and the bright frame for each lens was replaced within the field of vision. The term "full-size" represents the effect of looking through a piece of glass with no angles to refract light — in theory, a very simple mechanism. This was not the case with the Nikon SP, however. It is a complicated structure which incorporates a coincidence-type rangefinder and adds — one after another — frames which are compatible with a variety of lenses. Furthermore, the parallax (the difference in the position of view from the viewfinder and that from the shooting lens) is automatically fixed by a linkage with the rangefinder. Closely trailing the viewfinder in importance was the shutter. In its development, attention was paid mainly to two(2) areas. The first area was the improvement of overall shutter performance. Nippon Kogaku managed to reduce the mass of the mechanical portion, while increasing the speed of movement of the focal-plane shutter curtain. This enabled them to use a faster speedlight (about 1 / 60 sec.) than could be employed with the S2 (approx. 1 / 50 sec.). The 1 / 1000-sec. steadiness was also improved. 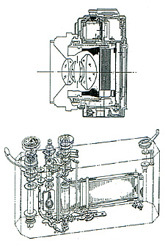 In addition, through the use of a different mechanism than was used in the S2, the movement of the shutter brake that stops the shutter curtain had become quieter. The other main area of focus was increased ease in shutter-dial handling. To achieve this, it was necessary to design the dial so that it would not rotate after the shutter had been released. Problems with the S2 caused by the lack of this innovation included disturbance of shutter movement when the user's finger inadvertently touched the dial, and differences in the settings before and after shooting. The redesign of the dial for the SP solved these problems. Thanks to this single-pivot, non-rotating shutter dial, featuring multiples at regular intervals, the exposure meter could be engaged with the peripherals of the dial (see photo below), and exposure setting became easier. An exposure meter that plugged into an accessory shoe was not revolutionary, but this was the first meter that was designed to be plugged in from the front of the shoe. This camera was considered modern and ambitious not only for the new innovations previously mentioned, but also because it incorporated technologies Nikon had been hanging on to — automatic restoring of the frame counter when the camera back is opened, and motor-drive attachment capability, among others. This devotion to advancement and improvement became a Nikon tradition, particularly evident in upper-level models from the SP to the F5. Even considering the numerous changes and innovations embodied in the SP, the developers wanted to ensure that it would be compatible with existing lenses and accessories. This meant that the size and layout of the mount system, and the design around the system, must remain the same as the previous model. This did place certain limits on the development of the direct-view viewfinder, but Nippon Kogaku recognized the importance of maintaining interchangeability with existing products — along with the original size and dimensions of the S2 — while increasing performance. The result was a camera absolutely packed with quality, functionality, operability...... and precision. As precise and complex as the Nikon SP was, the fact that it was expensive came as no surprise. When the SP was released in Japan(Nippon), for example, it was priced at 98,000 Japanese yen (including a 5cm f / 1.4 normal lens). This made it impossible to supply as many units as with the S2. It was rumored that, based on this reasoning, a lowering in viewfinder specifications — and thus a price decrease — was planned for the S3. This, however, was a falsehood. Actually, the S3 proved to be the base for the "SP sisters" — the lineup consisting of the SP, S3, S3M and S4. The internal name for the S3 was "26F1B", and the SP was known within Nippon Kogaku as "26F2B". The developers definitely bore the construction of the SP in mind while designing the S3. However, since they experienced difficulties in the mass production of the SP, Nippon Kogaku originally planned to pair the two(2) cameras together and make a substantial quantity of them available. The positioning of the S3, compatible with lenses in the 3.5cm ~ 10.5cm range, was as a "moderate" model — which it was, when compared with the 2.8cm ~ 13.5cm compatibility of the SP. The S3 does not incorporate a viewfinder for wideangle lenses, but the 3.5cm frame comes outside the full-size standard viewfinder's 10.5 / 5cm frame. As mentioned earlier, users cannot see the 3.5cm frame without rolling their eyes about. And, unlike the SP, with the S3 the three (3) frames are always indicated. There is no automatic parallax compensation. After the SP's release in Sep. of 1957, critics claimed that the "viewfinder was slightly dark". Overall, however, the SP was acknowledged worldwide as a "small, light camera that offers superior performance." Camera users reacted positively to the S3, released in March of the following year. Its popularity exceeded that of the SP for several reasons. Direct focus setting was possible when the 3.5cm lens was attached — it was no longer necessary to look at the viewfinder after framing was finished. Increased viewfinder brightness and simplified rewind operation are two more aspects of the camera that impressed users. The only drawback was that for users to make full use of the 3.5cm frame, they had to look at the viewfinder with both eyes open. The S4, released in March of 1959, and the S3M, which made its debut in April the following year, were both derived from product number "26FB". The S4 was positioned as a product that could compete during the trend of other companies lowering the prices of their coupled rangefinder cameras, as well as with the "performance and price" ratio of SLR cameras. In order to keep the price down, the S4 was designed based on the S3 and inherited a number of its characteristics. The S3M was designed for users who frequently take high-speed consecutive pictures (at about 6 frames / sec.). In order to shorten the time required for film advancement and give the user the quickest possible rate, Nikon reduced the image size from 24 × 36mm to half-size (or "Cine-size" — in the case of the S3M, 24 × 17.5mm). The Nikon SP performed admirably on the front lines of the world of photography. Shortly thereafter, though, SLRs became the popular choice of professionals and advanced amateurs. Nippon Kogaku themselves were preparing to release the F, also directed at professional photographers. The SP's standing became tenuous. The SP did, however, boast features not available in SLRs, so it remained in use as a wideangle camera. It was also used together with the Nikon F, a popular camera among press photographers and people in like occupations. As Nippon Kogaku intensified their efforts in the development of wideangle lenses for SLR cameras, and released new lenses one after another, the S3 became obsolete. It could be seen in catalogs for quite some time, but its life was actually relatively short. When compared with the S2, popular with many different types of users, the S3 was regarded as a camera used primarily by professionals. There was interest in the S3, but it appears that most of those people opted to purchase SLRs instead. Even in those days, Nippon Kogaku saw direct-view viewfinder camera features such as non-blinking viewfinders and short shutter time lag as highly advantageous. They believed that once the SLR's popularity peaked, people would realize the value of direct-view viewfinder cameras. Therefore, even after the release of the F, they actively developed coupled rangefinder cameras that surpassed the SP's performance (for example, the TTL (Through The Lens) metering "Nikon SPX" and the zoom viewfinder "Nikon SP II"). The anticipated wane in enthusiasm for SLR cameras never came, though, and the SP sisters were the last of the coupled rangefinder direct-view viewfinder cameras. Down, but not out. Today, the direct-view viewfinder camera with lens interchangeability is enjoying renewed popularity among amateurs. However, unlike the "SP" era, this type of camera is not equipped to do battle as an optical device with the features of today's cameras. The technology on which it's based is not considered worthwhile anymore. Will we ever see an SP "renaissance" ? Products name, brand name and companies name are trademarks or registered trademarks of their respective companies.